When life gives you a boatload of habanero peppers and strawberries, make some jam. 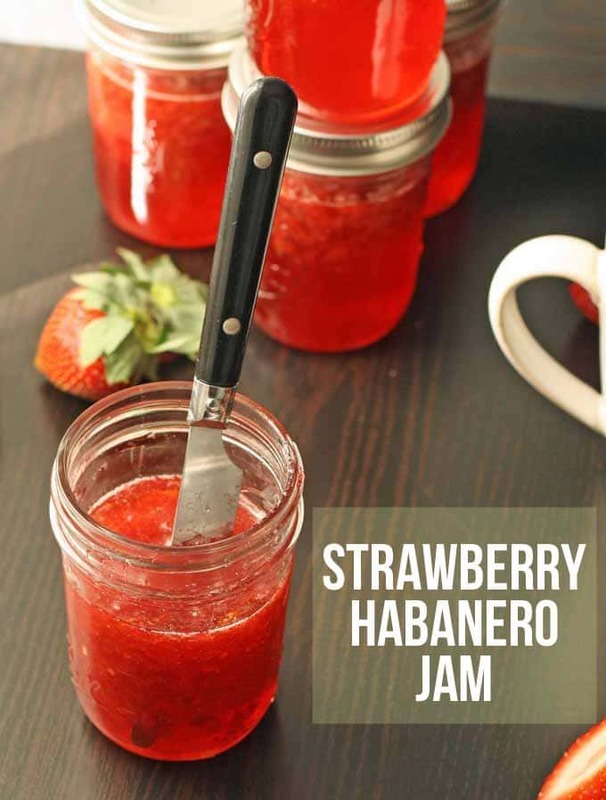 Strawberry habanero jam to be exact – spicy and sweet! When life gives you a boatload of habanero peppers, it’s kind of similar to when it gives a bunch of lemons. Since you can’t make habanero-ade, you might as well make some jam. 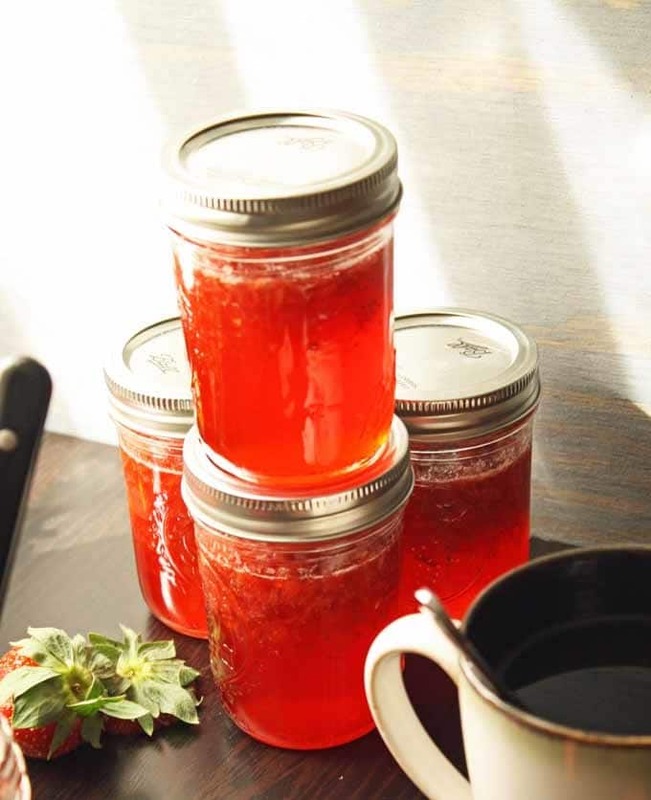 And since it’s also farmers market season and strawberries are available aplenty, strawberry habanero jam. After I made tomato habanero relish the other day, I still had about 40 habanero peppers leftover. My good friend Kristina from Cucina Kristina offered to dehydrate the gang of peppers for me. Once I brought them over to her house, however, we decided to also take advantage of all of her canning equipment. 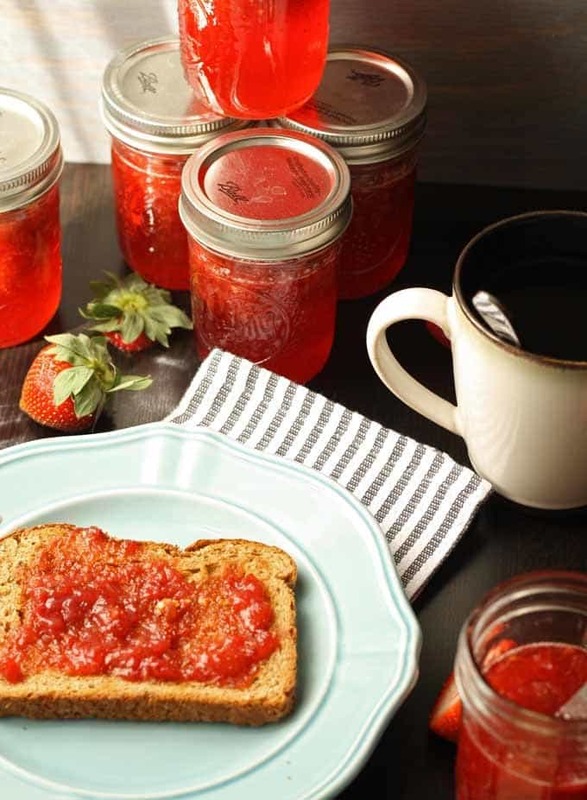 Neither one of us had ever made strawberry jam before, but we figured it couldn’t be that hard. And it wasn’t. The only hiccup we had was with the pectin. 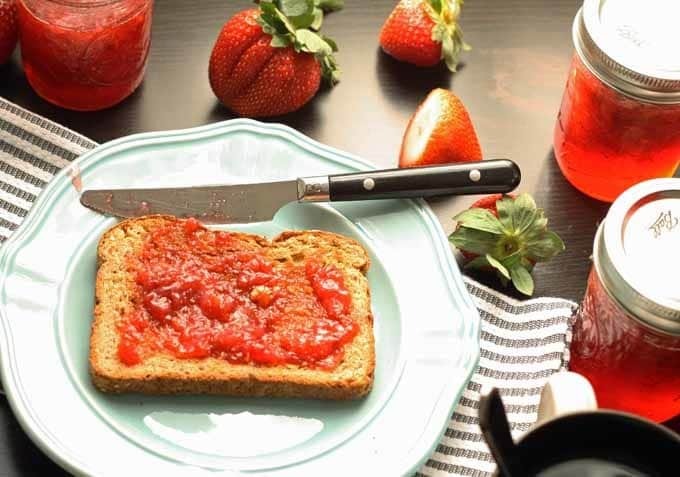 Did you know that there are different recipes for jam based on the type of pectin you have and that there are three different types of pectin? Yeah, me either. I made the mistake of buying the instant pectin when what I needed was the liquid pectin. Thankfully I realized my mistake before we really got started so a quick run to the store remedied my error. Just so all you future jam makers know, your recipe may call for powdered (aka classic), liquid or instant pectin. Make sure you have the right one for the recipe you are planning to use and you should be ready to go. (affiliate link) book and added the habanero peppers. I am not going to go too crazy into the actual method of canning – it has been explained really well by others so I will just direct you to some sources for that (after the recipe). Kristina and I both like spicy stuff so we left all of the habanero seeds in. 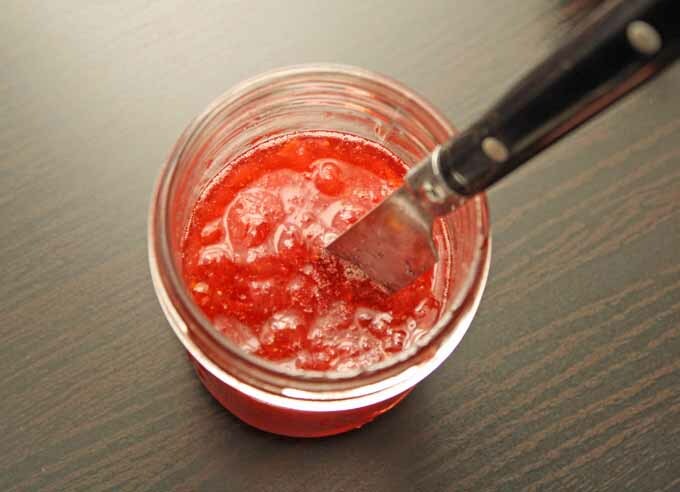 If you want a jam that is more mild, remove all or some of the habanero’ seeds before mincing. Prepare a boiling water canner. Heat jars and lids in simmering water until ready for use. Do not boil. Set bands aside. Combine strawberries, sugar, lemon juice, and habanero peppers in a medium saucepan. Bring to a rolling boil over high heat. When you cannot stir down the foam, gradually stir in the pectin. Bring mixture to a full rolling boil that can not be stirred down, over high heat, stirring constantly. Boil hard 1 minute, stirring constantly. Remove from heat. Skim foam off the top. Ladle the hot jam into hot jars leaving 1/4 inch headspace. Wipe rim and center lid on jar. Apply band until it fits tight. Process in a boiling water canner for 10 minutes. Remove jars and cool. Check lids for seal after 24 hours. Lid should not flex up and down when center is pressed. 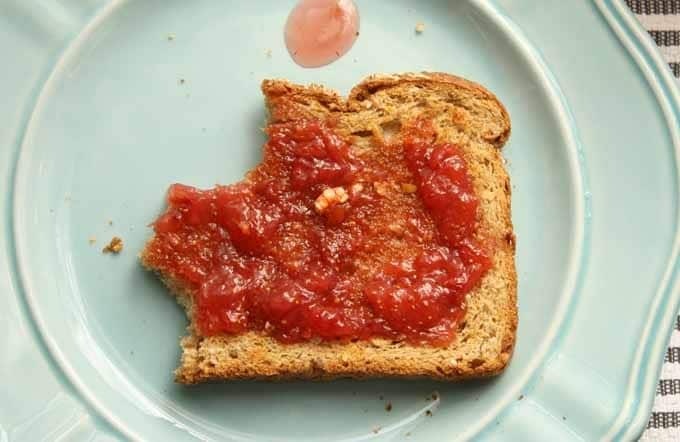 I decided to start the following morning off with a bang and put the strawberry habanero jam on a piece of 12-grain toast. Whew, the spice sneaks up on you but between the jam and my coffee, I am ready for this day. We are also going to make some PB&J’s with it and I’m thinking about making some thumbprint cookies or kolazcky with it as well. The world is our spicy oyster. I think everyone should go out to the nearest farmer’s market and buy a bunch of fresh fruits and vegetables to can. The canning bug has got me!! Thanks for the pectin lesson. 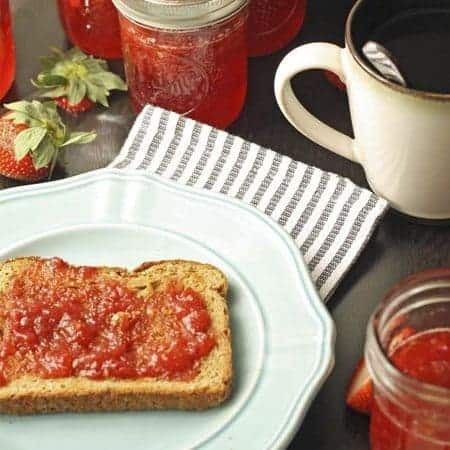 I have noted this for future ventures 🙂 This jam looks amazing! I cannot wait to come over and try some! Thanks Ewa!!! I am going to save a jar for you. 🙂 Or if I can’t save it, I’ll have a great excuse to make more! That looks delicious! Love the colour! Now and again I make jams and preserves (usually soft summer fruits and berries) and yes, it is really easy to do. And the taste is so much better. To avoid the pectin issue, I always use sugar with pectin already mixed and that works a treat. I use different kinds depending on how sweet or fruity I want the jam to turn out. Or depending on the natural sweetness of the fruit. Normally you would use a 500g pack of pectin sugar per 1 kg of fruit (sorry about the metric measurements!). But as I like jams to be a little tangy, I normally use a sugar mix where I need 1 pack for 1,5kg fruit. I hope you can find the sugar/pectin mixes nearby, they will make your jam-making-life a lot easier. PS: I always add some black pepper (or grated ginger) when I cook strawberry jam. PSS: 3/4 strawberries with 1/4 rubarb (use enough sugar!) and 3/4 apricots with 1/4 of passion fruit are also very yummie combinations. Thanks Marleen – I love all the tips! It was easy but there is still so much to learn! Thanks Katie! It’s very yummy! Oh! This sounds amazing! Love your bright pictures! So pretty! We have pepper jelly, but I think this would be even better! Pinning to save and try sometime! Thanks Hannah! Taking the pictures is half the fun for me 🙂 The other half is eating the food afterwards. Do you happen to have a recipe that doesn’t use pectin? I have used apples in the paste, as they have a lot of pectin in them. You include the core during cooking, then take it out later. Thanks. Hi Deborah! I don’t have a recipe that doesn’t use pectin but I will look into it and start testing one. I’ll update my comment if I am able to successfully make one.